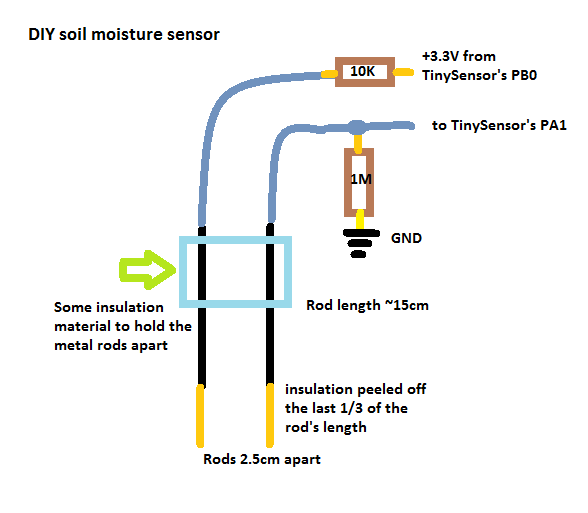 Soil Moisture Sensor is used to measure dielectric permittivity of the surrounding area. In soil, dielectric permittivity is a function of the water content. These sensors create a voltage proportional to the dielectric permittivity & therefore the water content of the soil. This invention relates to an electrical resistivity method. which is used for testing the moisture content of sail. The electrical resistivity of that soil is sensed by a novel soil moisture sensor having two electrodes. which have in direct contact with the soil under test. This mixture of sensors & soil which associated with it become variable resistive components of an electronic network. whose output is used to energize a meter for quantitative measurements( or you can say A miniature lite bulb for qualitative monitoring.). A floating or A breathing electrode to compensate for the adverse effects of unpredictable variation in contact pressure. Which is between the sensor electrodes and associated soil. A means for de-polarizing sensor electrodes, A means for assuring against electrical ground loop, A novel solid state circuit for translating soil moisture into the light intensity of a miniature lite bulb. Reflected microwave radiations are affected by the soil moisture & are used for remote sensing in hydrology & agriculture. Portable probe instruments are can be used by farmers or gardeners. Soil moisture sensors are typically referred to sensors that estimate volumetric water content. Most soil moisture sensors are designed to estimate soil volumetric water content based on the dielectric constant (soil bulk permittivity) of the soil. The dielectric constant can be thought of as the soil’s ability to transmit electricity. The dielectric constant of soil increases as the water content of the soil increases. This response is due to the fact that the dielectric constant of water is much larger than the other soil components, including air. Thus, measurement of the dielectric constant gives a predictable estimation of water content.This sensor can be connected in two modes; Analog mode and digital mode. First, we will connect it in Analog mode and then we will use it in Digital mode. The Module also contains a potentiometer which will set the threshold value and then this threshold value will be compared by the LM393 comparator. The output LED will light up and down according to this threshold value. Frequency Domain Reflectometry (FDR): The dielectric constant of a certain volume element around the sensor is obtained by measuring the operating frequency of an oscillating circuit. Time Domain Transmission (TDT) and Time Domain Reflectometry (TDR): The dielectric constant of a certain volume element around the sensor is obtained by measuring the speed of propagation along a buried transmission line. Neutron moisture gauges: The moderator properties of water for neutrons are utilized to estimate soil moisture content between a source and a detector probe. Soil resistivity: Measuring how strongly the soil resists the flow of electricity between two electrodes can be used to determine the soil moisture content.